In April, we traveled to Switzerland and Italy as a delegation of five. During the trip, we visited several international organizations and local government departments, including the Swiss Agency for Development and Cooperation (SDC) and the Federal Social Insurance Office (FSIO) in Switzerland, as well as the Italian Ministry of Foreign Affairs and International Cooperation (MAECI), the Food and Agriculture Organization of the United Nations (FAO), the International Fund for Agricultural Development (IFAD) and the Italian Agency for International Development (AICS) in Italy. We also attended the FAO Council Side Event, IFAD’s learning event on China’s experience in poverty reduction, and a seminar on “Global Partnerships for Poverty Reduction”, by means of which we had in-depth exchanges with a raft of international experts in the field of poverty reduction. Astonished by China’s experience and achievements in this field, the experts set an expectation that China play a greater role in implementation of the sustainable development goals (SDGs), benefitting the international community by promoting its model and methods through knowledge sharing. 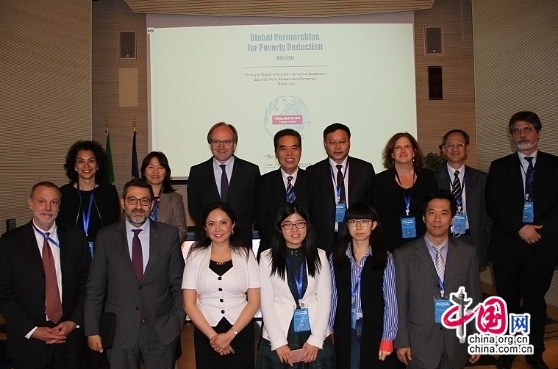 CIIC-IPRCC delegation and representatives at the seminar on “Global Partnerships for Poverty Reduction”. China’s methods and achievements in poverty alleviation have won widespread recognition from experts in the field. At the seminar on “Global Partnerships for Poverty Reduction” co-hosted by the China Internet Information Center (CIIC), the International Poverty Reduction Center in China (IPRCC), AICS, FAO and IFAD, at the Italian Ministry of Foreign Affairs and International Cooperation, Ashwani Muthoo, Director of Global Engagement, Knowledge and Strategy Division (KM), IFAD, spoke highly of China for its efficiency in delivery systems. Both the theory and practices of targeted poverty alleviation show a high likelihood that China will eradicate poverty, through a sound political vision, a scientific strategy and appropriate policies. China’s success will also provide inspiration to the cause of global poverty reduction. Davide Giglio, Head of the North-East Asia Office, Directorate General for Global Affairs, MAECI, took the view that sustainable urbanization was one of the reasons for China’s success in poverty reduction, and that China has avoided some of the ills often associated with urbanization, particularly large-scale urban poverty and unemployment. Sharing China’s experience with the world will be a driving force for achieving the SDGs . The experts expressed an expectation that China would play a greater role in international affairs, accelerating the drive to achieve the SDGs. Pietro Sebastiani, Director General for Development Cooperation, MAECI, said that China, as the world’s second largest economy, has an important role to play in the international community. He appreciated China’s efforts in South-South Cooperation and collaboration with impoverished areas in Africa. In addition, he proposed that China and Italy work more closely to promote global poverty reduction.